Captain Albert De Groot felt he owed a lot to the newspaper publishers of New York City. The 59-year old steamer captain, now retired, desired to somehow repay “the many favors he has received from the press of this city,” as later explained by Horace Greeley. An immense bronze statue in Printing House Square, he felt, would do nicely. De Groot was responsible for the ornately-decorated steamboats that copied his Jenny Lind, built around 1850. During the Civil War he built the steamers Resolute and Reliance for the government and made a name for himself in the naval service. But his fortune came as captain of steamers owned by Cornelius Vanderbilt. As a sign of appreciation, he had worked with German-born sculptor Ernst Plassman to create a bronze statue of the Commodore. The completed sculpture was dedicated in 1869. 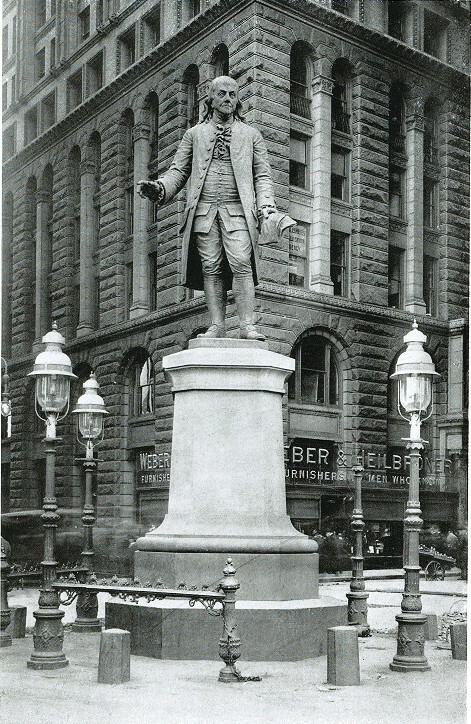 A year later De Groot turned to his next project—a statue of Benjamin Franklin, America’s first newspaper editor, as a tribute to the printers and newspaper publishers of New York City. He called upon Ernst Plassman once again. “Please specially oblige us by calling, on Monday or Tuesday (any hour from nine to five), at our counting-room to see Captain Albert De Groot’s idea of a colossal Statue of Franklin. The critiques continued to glow. The Commercial Advertiser called it “the finest of the kind we have seen,” and the New York Herald said it “is decidedly one of the most admirable representations of Ben Franklin that has ever yet been designed.” For nearly a week the comments flowed in. The New York Sun, The New York Courier, The New York Dispatch all gave their assessments. While the opinions were overwhelmingly positive, there were a few suggested adjustments. The Herald felt “the only fault which an artistic eye could discover was in the right arm, which lies too formal and straight to the body to look natural.” Each comment was carefully considered by the artist and rectified. By November 1 a larger model was completed and Baker & Godwin issued another invitation; and another line of newspapermen filed past the statue. The comments were even more complimentary than before. While the artist and De Groot busied themselves with the completion of the statue, the newspapermen focused on providing an appropriate base. The city had given permission to place the statue among the newspaper and publishing houses in Printing House Square. If the statue were to be unveiled on Franklin’s birthday, the publishers needed to act swiftly. At 2:00 on the afternoon of October 26, 1871, ground was broken for the cornerstone of the statue. The Honorable John H. Anthon of the Masonic fraternity of the State of New York conducted the ceremonies with full Masonic rites. Despite the drizzling rain, a large crowd assembled and the Fifth Regiment Band played. The box placed inside the cornerstone contained a long list of items including copies of the Constitution of the United States and the State of New York, a Bible, "Parton’s Life of Franklin," Appleton’s Railway Guide, Hoe’s Catalogue of Printing Machines, etc., Type Founders’ Specimen Books, various New York City newspapers, almanacs, calendars and business cards of New York printers. Also included were a map of Chicago and illustrated newspapers describing the recent tragedy that shook the nation—the great Chicago Fire had occurred only 16 days earlier. Fischer Brothers was given the task of casting the immense statue—one of the largest ever made in the United States to date. On December 5, 1871 it was ready for examination at the foundry at No. 209 Forsyth Street, near Houston Street. De Groot had spared no expense in the 12-foot tall statue. The bronze used was of exceptional quality, even for monuments. “An unusual proportion of the metal is pure copper,” the ceremonial pamphlet of the unveiling would later report. In the meantime, the publishers had been busy with the pedestal. The committee of newspapermen had decided on a monolithic granite base in what they called “of the modern style of architecture.” A single, 16-ton block was quarried at Mill-Stone Point, about six miles from New London, Connecticut. It was the largest single piece of granite ever transported over New York City streets, taxing the pavement. 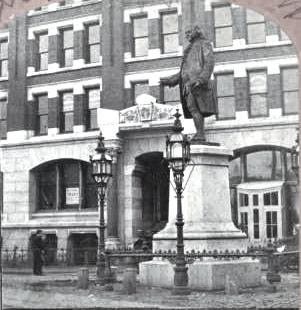 Fisher & Bird constructed the pedestal at their workshops on Houston Street. The base stone was eight feet, six inches square, over which two blocks of granite rested. The foundation necessary to support the massive weight of the pedestal and the 3,500-pound statue reached seven feet below ground. To protect the statue and illuminate it, decorative cast iron railings and lamps were manufactured and put in place on January 6, 1872 along with the granite base. Four days later the statue was erected and immediately cocooned in “the drapery of the American flag.” It would remain covered, eliciting the curiosity of passersby, for eleven days until Benjamin Franklin’s birthday. The unveiling, two days later, would be no small matter. Long before the ceremony was to start, a crowd estimated at between 20,000 and 30,000 had arrived. “All the windows and balconies in the neighborhood were filled with ladies. The most sanguine among the projectors of the celebration could not have anticipated that it would have been witnessed by so great a concourse of people,” said the Record of the Proceedings and Ceremonies. “The police arrangements were excellent, but the hundred and fifty men would have been powerless to keep the space around the Statue clear had they not been assisted by strong stakes and chains,” it reported. The ceremonies began just after noon, headed by Samuel B. Morse. Horace Greeley sat on his one side and Peter Cooper on the other. All the prominent printers of the city were on the platform as were politicians. Ernst Plassman was noticeably absent due to illness. After his short address, the statue was unveiled. The “Star Spangled Banner” was played as the drapery fell, a salute of artillery was fired in City Hall Park and the crowd roared. Immediately following the unveiling, Morse left the platform and Charles C. Savage, President of the Board of Trustees of the New York Typographical Society slipped into his place. It would be Morse’s last public appearance. He was intended to be the guest of honor at the banquet at Delmonico’s that evening, but he listened to the pleadings of his family and stayed home. On the 2nd of April he died of pneumonia. At 7:00 that evening the banquet was held at Delmonico’s on 14th Street. By each of the 136 plates was a facsimile of the September 10, 1741 issue of the Pennsylvania Gazette. “The room was tastefully decorated with bunting, and the tables were beautifully ornamented,” said the Record of the Proceedings. Among the diners were the most noted names of the day: Horace Greeley, the Reverend Henry Ward Beecher, Peter Cooper, Erastus Brooks, H. O. Houghton and others. Among the many toasts presented that evening was one sent by telegraph by the President of the United States. Unfortunately, the hours of labor the two men spent on the statue did little to help it. “But when they were through the statue was not much improve in appearance,” said The Times. “The dirt had been allowed to stay so long that it had generated an acid which had eaten into the statue.” It was a situation that would have to be addressed several times to come. But whether the critics liked the statue or not, the public did. Year after year for decades it was the center of celebration on Franklin’s birthday. Platforms were erected and ceremonies staged with great fanfare. 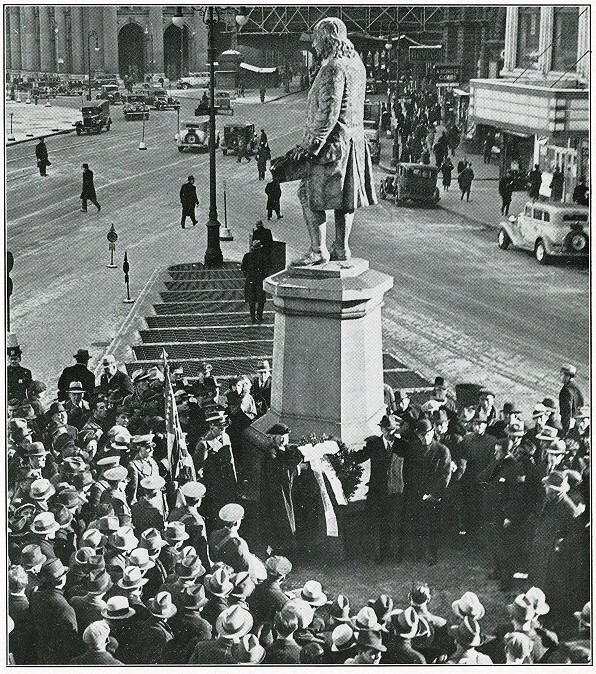 In 1922, for instance, nearly forty wreaths were laid at the statue by organizations somehow affiliated with Franklin—printers, the post office, electrical workers, libraries, and others. 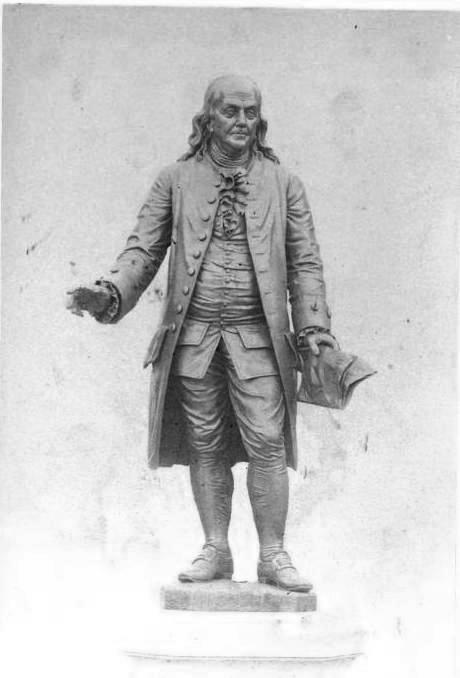 That year, in recognition of his experiments with electricity, Franklin’s statue was outfitted with a string and kite were attached to his right hand. A few feet up the string a large key was tied. “The other end of the kite was hitched to the City Hall, so that it would not be torn away by the winds,” reported The New York Times. The effects of dirt and pollution that were noticed by the two men in 1889 continued throughout the 20th century. Environmental corrosion prompted the Parks Department to treat and restore the statue on four occasions from 1940 into the 1980s. In 1999 a total conservation was conducted by the City Parks Monuments Conservation Program. 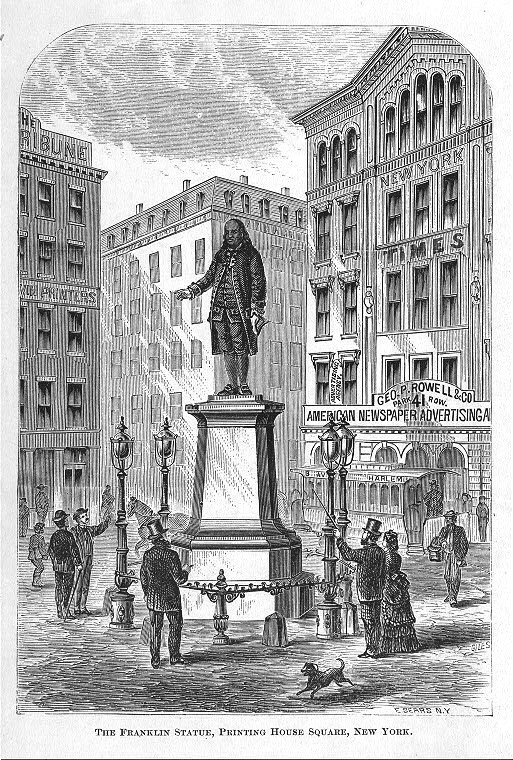 Today, although stripped of his Victorian cast iron lamps and railings, the monumental tribute to Benjamin Franklin stands watching passing New Yorkers as he did a century and a half ago. Wow, the lamps and railings really elevated the presentation. It's sad to see how stately the site once was, given its comparatively tawdry state today.